New opportunities for direct public contact with Haverhill police and other agencies are to be set up from next week. Suffolk-based affordable homes provider Havebury Housing Partnership has welcomed Philip Sullivan as its new director of operations and deputy chief executive. Listings for films showing or booking at Haverhill Cineworld for the week beginning September 3. A massive £10,000 has been raised at an annual charity golf day run by Suffolk affordable homes provider Havebury Housing Partnership. A new project for gauging the behaviour patterns of people who use Haverhill town centre is to be introduced to business people in the town soon. Top international cyclists will be passing through Haverhill a fortnight today (Friday) when the Tour Of Britain reaches this part of East Anglia. Plans for Haverhill Research Park hit a snag this week when councillors dug their heels in against changes to the scheme which had been backed by local business and education leaders. A new on-demand bus service for villages west of the A143, and including Haverhill, has been launched by Suffolk County Council. Free advice for resource-hungry businesses is available at the launch of a new supplier network, open to those who supply St Edmundsbury Borough Council. More than 1,400 motorists were caught speeding in Suffolk during a week-long European speed enforcement campaign in the county between Monday and Sunday, August 23-29. Listings of films showing or booking at Haverhill Cineworld from September 10. Haverhill Golf Club girls lifted two of the three trophies at the annual Suffolk Ladies County Golf Association run the High Handicap Cup for junior girls. 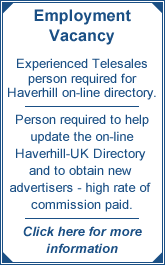 Businesses are being asked to help disseminate a survey to find out how people use Haverhill town centre. Terry Jones has been appointed head of the employer responsive unit within the faculty of arts and technology at West Suffolk College. Young footballers from Haverhill who took part in a summer scheme will be competing in a mini-competition at the home of Ipswich Town on Sunday. A child can go into pubs in Suffolk and purchase cigarettes from vending machines without being challenged. Excitement is building up with the approach of the Tour Of Britain cycle race to Haverhill on Friday. EASTERN COUNTIES LEAGUE DIVISION ONE: Southwold 74 Haverhill 0. Match report. Haverhill's senior policeman has thanked the members of the public who turned up to the new-look Safer Neighbourhood Team meeting last week and made it a success. Patrick Hamilton has been appointed as head of school of engineering at West Suffolk College. He will be managing and leading the automotive, engineering and mechatronics sections. Police have begun a crackdown on shoplifters in Haverhill town centre, which will run through until Christmas. Listings for films showing or booking at Haverhill Cineworld for the week beginning Friday, September 17. There's £100 worth of shopping vouchers which can be won if you take part in the latest survey about the usage of Haverhill town centre. With the approach of autumn and the nights drawing in, Haverhill police have issued a warning to residents to make sure they keep their property secure. A new free training scheme is being offered to all retailers and their staff who sell alcohol and other age restricted products in Suffolk, and there will be sessions in Haverhill. Haverhill Golf Club’s campaign to retain the Curry Cup for 2010 was decided last weekend when the defending champions were drawn against Benton Hall at Colne Valley on Sunday, September 5. EASTERN JUNIOR ALLIANCE UNDER 16s: Haverhill Rovers U16 EJA 4 Witham Town 0. Match report. Hundreds of people lined the route through Haverhill of the Tour of Britain cycle race this morning to cheer on the 80 riders on their stage from Bury St Edmunds to Colchester. Three quarters of people feel unsafe when shopping online, according to a new survey into e-commerce conducted by the Trading Standards Institute. More clouds gathered last week around American biotechnology giant Genzyme, which has major research and production sites in Haverhill, after it announced the axing of over 1,000 jobs worldwide. Police are urging people to be vigilant following three rogue trader incidents in West Suffolk. The winners of The St Edmundsbury Sports Awards 2010 will be announced at a glittering ceremony at Bury St Edmunds Corn Exchange on Sunday. EASTERN COUNTIES LEAGUE, DIVISION ONE: Haverhill 3 Cantabs 60. Match report. Improvement of the A1307 Cambridge road is the major ambition for Haverhill of the town's new MP Matthew Hancock. Listings for films showing or booking at Haverhill Cineworld for the week beginning September 24. Local teenager Jade Donno has been given the big thumbs up by judges at the Open Mic UK auditions. Town councillors have decided to hang fire on contributing towards two schemes aimed at improving safety for pedestrians and cyclists around School Lane. A Haverhill town councillor urged the town's police chief to do more to catch people who put banners and bosters on Wratting Road footbridge. Suffolk County Council has voted to find other organisations to provide a large proportion of its services. Yobs who get into trouble in Haverhill on a Friday night could be sanctioned by the football clubs they play for on Sunday mornings, Haverhill town councillors heard this week. A fantastic team of ladies from Haverhill – led by a 93-year-old great grandmother – has helped St Nicholas Hospice Care achieve its most successful fundraiser of all time. A Haverhill councillor has admitted to being 'very uncomfortable' about the decision by her colleagues on Suffolk County Council to look into selling off all its activities. Paralympic athlete Caroline Mclean won the Sports Personality of the Year award at the 2010 St Edmundsbury Sports Awards, held on Sunday evening. Twenty-five musicians travelled to Haverhill from across Europe to take part in the finals of this year's Haverhill Sinfonia Soloist Competition. Abbeycroft Leisure’s sporting ambassador, swimmer Tom Cole, is to compete in the World Downs Championships in Taiwan next week and defend his world record. On Wednesday and Saturday, September 15 and 18 the Ladies Fraser Plate was competed for at Haverhill Golf Club. Children and their parents enjoyed a range of healthy activities at Havebury Housing Partnership’s first family day – with a special appearance from two Ipswich Town football players. Funding constraints which, it had been feared, could scupper plans to move Haverhill's Friday market to High Street, will not affect the progress towards pedestrianisation in the town. An outdoor gym for children and adults was officially opened at East Town Park in Haverhill on yesterday. Listings of films showing or booking at Haverhill Cineworld for the week beginning October 1. Samuel Ward Arts and Technology College is holding its open evening for years six, seven and eight next week. Cineworld Haverhill will be playing host to a DeLorean car on Friday evening, to celebrate the rerelease of Back To The Future. Affordable homes provider Havebury Housing Partnership has been celebrating the achievements of some of its 6,000 tenants at its first Residents’ Day. An event for children under five is to be held at the Cartwheels Children's Centre, Norton Road, Haverhill, on Friday, October 8. There is an opportunity to find out more about local enterprise partnerships (LEPs) at Menta's monthly breakfast meeting in Haverhill, the Very Early Lunch Club next week. Superfast broadband is coming to Haverhill, removing one of the major problems for town businesses. There will be a new PC on the beat in Haverhill town centre from next week, the first to be specifically dedicated to that area for two years. A young Haverhill dyspraxia sufferer has been made the first national young ambassador for the charity which works for the disability. Young people from across Haverhill headed off to university this week, but at the other end of the age scale the new academic year was also beginning.